This is an unauthorised version of the Rubik's Magic Master Edition, so it is also a 2×6 Rubik's Magic. I don't know the name this version was sold under, but I call it Magic Rings. The design shows a small logo reading "V.V.V. puzzle", the year 1987, and the two signatures of the designers. The rectangular starting position shows five linked circular rings. The solved arrangement is in the shape of a cross, with the yellow ring in the centre. An interesting feature of this version is that the string loops are longer. There are only 12 loops, each wrapping around 5 tiles. 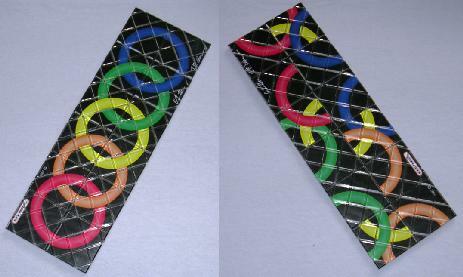 If you wish to make one yourself you can just use the standard loops that are 3 tiles long. See the section on making our own magic. Hold the puzzle in the starting position, but face down so that the unsolved side is visible. In the following description the tiles are numbered 1-12 clockwise from the top left as usual. Fold tile 2 (and 3) underneath tile 1, and at the same time tile 8 (and 9) underneath tile 7. In the steps c-g we will essentially do the six-flip shape changing transform on both ends of the magic simultaneously. Fold 1 and 2 down onto 12, and also 7,8 up onto 6. Fold 2,3 to the right, onto 4,11, and also 8,9 to the left onto 5,10. Fold 1,2 upwards onto 3, and also 7,8 downwards onto 9. Fold 2 leftwards onto 1, and also 8 rightwards onto 7. Fold 2,3 upwards, and also 8,9 downwards. Fold the right half (tiles 5-10) onto the left half (onto tiles 1,4,11,12). Grab the two tiles nearest to you (tiles 8 and 9) and give them an 180 degree twist, turning them over. This will actually fold tiles 6-8 to the right onto tile 5, and 9-11 to the left behind 12. Fold tiles 1 and 12 leftwards and 6 and 7 rightwards, opening the arms of the cross. Hold the puzzle in the starting position, but face down so that the unsolved side is visible. Do the loop shift transform or the star shift transform to shift everything along two tiles, so that you get two yellow semi-circles. Fold the two leftmost tiles to the right on top of the adjacent tiles, and similarly fold the two rightmost tiles to the left. Fold the magic in half, bringing the left half and the right half down, becoming a thick vertical square viewed from the side. Split open the front and back, folding together the right half and also folding together the left half, again resulting in a thick vertical square, directly facing you. Fold open the magic, the front six tiles forward and the rear six tiles backwards. You now have a 2x4 rectangle with a 2x2 set of tiles on top in the middle. Fold open the 2x2 top tiles into the two arms of the cross. Fold tiles 6 and 7 leftwards behind tiles 5 and 8. Fold tile 6 down behind tiles 7 and 8. Fold tiles 7,8 to the left, onto tile 9. Fold tiles 7,8 (and 6) upwards onto tile 4 (and 5). Fold tiles 6,7,8 downwards onto 9,10. Fold tile 8 rightwards onto 7. Fold tiles 8,9 downwards, to form one arm of the cross. Repeat the same sequence on the other end to create the other arm of the cross.